Today’s information technology driven organizations seek to develop business management processes to optimize assets. Unfortunately, in many organizations, silos have emerged. Silos are those business management systems that are unable to operate with other business systems, creating fragmentation in the overall business management of the company. Most commonly, this applies to the disparate approaches taken in Information Technology Asset Management (ITAM) and Information Technology Service Management (ITSM). Both are necessary to maximize the return on investment obtained from your assets, but many organizations’ IT Asset Management and IT Service Management teams fail to communicate clearly and collaborate together. The problem with this paradigm is that inefficiencies and redundancies emerge which decrease the overall productivity of the company. Assets are not maximized to their full potential, and time and resources are wasted when ITAM and ITSM processes function in two different spheres. For these reasons, it is important to find ways to integrate the processes between the two systems in order to increase the well-being of the company. To do this, it’s essential to understand how each system functions. IT Asset Management generally refers to the set of practices that a company employs to best manage the assets of the company. Assets include any hardware or software that a company requires to operate. Management of hardware and software assets involves monitoring hardware life cycles, collecting information on software use, and planning and making strategic decisions for the future. IT Asset Management is vital because it helps companies decide about asset purchases and redistribution and safeguards against data security risks. IT Service Management, on the other hand, refers to all activities performed by a company to “plan, design, deliver, operate, and control IT services offered to the customers.” IT Service Management differs from other technology-focused IT management processes because it focuses on the customer’s IT product needs and services with an emphasis on progressive improvement. Without a doubt, both IT Asset Management and IT Service Management systems are necessary for a company to function well. But when ITAM and ITSM systems don’t work together well, the company loses the tremendous potential for growth and ends up wasting valuable time and resources. Optimizing assets is best accomplished through collaboration and communication between the ITAM and ITSM teams. The key to open communication is automation. Usually, systems are already in place to monitor anything from a hardware asset’s lifecycle to a software’s regular use or emergent customer needs. Information from this monitoring can be made available to all IT teams through automated solutions. Making automation of shared information available to all IT teams allows them to work together in unique ways. For example, IT organizations can offer Software as a Service (SaaS) through the collaboration of IT asset management and IT service management teams. SaaS is a software distribution model where a provider hosts applications and makes them available to their customers via the Internet. Furthermore, IT Service Management leaders can relay to the asset management teams what problems customers are experiencing with the company’s IT products and together they can search for solutions. Just as the body is made up of many parts that function together as one whole, so should an organization’s multiple parts work in unison towards a greater goal. None of the individual parts is more or less important than the others as each relies on the others to operate more efficiently itself. Your brain provides each part of your body with the information necessary to know how to act in a given situation, and information automation works much in the same way in regard to IT business management systems. IT Asset Management and IT Service Management are both vital to an organization’s well-being and growth. And silos must be destroyed to best optimize assets, both ITSM and ITAM need to work together and settle the conflicts waged over asset territory. 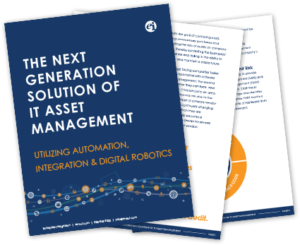 By maintaining open communication through automation programs, both management processes will be able to work in conjunction with one another and maintain peace in the asset management world. Enterprise Integration, in our partnership with Eracent, allows IT departments within organizations to communicate more effectively, identify better data and establish automated processes to populate Asset Management Repositories and Configuration Management Database (CMDB). ITMC DiscoveryTM provides enhanced functionality to help the two areas of ITSM and ITAM work together.